January 2nd, 2017 - The regular monthly meeting for our camp was held at our Headquarters. Compatriot Michael Pepper, Upshur County Patriots, gave our Program, the Confederate Navy in Shreveport. Commander Joe Reynolds gave a recap of 2016 and outlined his goals for 2017.
speaks about the Confederate Navy in Shreveport. January 3rd, 2017 - Commander Joe Reynolds attended the Monthly Stated Meeting of the Upshur County Patriots, Camp #2109 in Gilmer, Texas. January 4th, 2017 - Commander Joe Reynolds placed Confederate Flags on seven graves at Old Union Cemetery for Jerry Don Reynolds, who is out of town. January 7th, 2017 - Commander Joe Reynolds and 1st Lieutenant Commander Rex McGee attended the Texas Division Executive Committee Meeting in Gatesville, Texas. 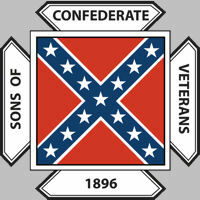 January 9th, 2017 - Commander Joe Reynolds and Compatriot Jimmy Reynolds visit Concord, Cookville, and Phillips Taylor Cemeteries in order to place Confederate Flags on Graves and make sure that they were in Good Repair. Final resting place of our Camp Namesake, First Lieutenant David Richard Reynolds, CSA. January 14th, 2017 - 1st Lieutenant Commander Rex McGee visited Greenhill and Nevills Chapel Cemeteries to replace worn or faded flags. January 20th, 2017 - Compatriot Rodney Love visited Linden and Shiloh Cemeteries to replace worn or faded flags. January 21st, 2017 - Compatriot Rodney Love attended Confederate Hero’s Day in Longview Texas and participated by carrying the Bonnie Blue Flag. January 24th, 2017 - Commander Joe Reynolds visited Bennion, Bridges Chapel, Cook and Tranquil Cemeteries to replace worn or faded flags. January 25th, 2017 - Commander Joe Reynolds and Compatriot Rodney Love visited Antioch, Center Grove, Centerhill and Mt. Zion Cemeteries in Cass County. The purpose of the visits was to place flags and take pictures in order to submit Guardian Applications for Compatriot Love. Compatriot Rodney Love Standing next to a Confederate Hero that he is adopting in the Guardian Program. January 26th, 2017 - Commander Joe Reynolds and Compatriot Talks With White Buffalo visited Center Grove in Titus County to replace torn and faded flags on Confederate Heroes Graves. January 28th, 2017 - Commander Joe Reynolds and wife Keithrie, attended the General Robert E. Lee and General "Stonewall" Jackson Birthday Party, sponsored by the Colonel Richard Bennett Hubbard #261 Camp, Military Order of the Stars and Bars, in Tyler, Texas. February 6th, 2017 - 1st Lt. David Richard Reynolds Camp #2270 held our Monthly Meeting at our Headquarters. Compatriot Charles Hayes of the Captain James P Douglas Camp #124 in Tyler presented our Monthly Program - Civil War Limericks. 1st Lt. Commander Rex McGee Received an Oak Leaf Cluster to his Guarding Medal and was awarded 3 new Certificates by Guardian Chairman, Phil Davis. to Compatriot Charles Hayes for his Monthly Program. February 9th, 2017 - Commander Joe Reynolds and Compatriot Talks With White Buffalo searched for, located, and visited Johnson-Batte Cemetery. There are only 5 graves here and only one of them is marked. We will attempt to obtain a Veteran's Marker for Pvt. Albert Curlee Smith. February 10th, 2017 - Commander Joe Reynolds. 1st Lt. Commander Rex McGee and Compatriot Talks With White Buffalo along with members of the Upshur County Patriots, Steve Austin, Titus County Veterans Officer, and family members visited the Snodgrass Cemetery, where 6 Confederate Heroes are buried, was just declared a Historical Marker, thanks to Ms Joyce Fountain. to Joyce Fountain for her efforts in honoring our Confederate Heroes. 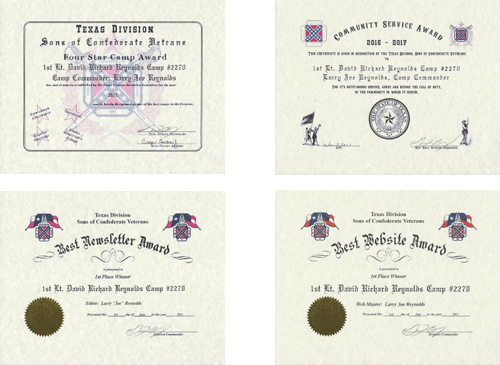 February 25th, 2017 - Commander Joe Reynolds attended the Army of Trans-Mississippi Symposium, hosted by the Red Diamond Camp at Hooks, Texas. February 25th, 2017 - Compatriot Rodney Love attended and marched in the Parade during Madri Gras in Jefferson, Texas. 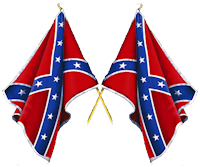 March 4th, 2017 - Commander Joe Reynolds and 1st Lieutenant Commander Rex McGee attended the annual Confederate Flag Day at Camp Ford, Tyler, Texas. This was a joint event with the with the 4th, 5th, 7th, and 8th Brigades of the Texas Division. March 6th, 2017 - 1st Lt. David Richard Reynolds Camp #2270 held our Monthly Meeting at our Headquarters. Instead of a guest speaker we held a business meeting. March 7th, 2017 - Commander Joe Reynolds attended the General Sam Bell Maxie Camp #1358 Monthly meeting in Paris, Texas. March 16th, 2017 - Commander Joe Reynolds and his wife Keesie attended the General John Gregg Camp #958 Monthly meeting in Longview, Texas. March 18th, 2017 - Commander Joe Reynolds and 1st Lt. Commander Rex McGee attended the Texas Division DEC Meeting in Gatesville, Texas. March 22nd, 2017 - Commander Joe Reynolds and wife Keithrie, attended the W. W. Heartsill Camp #2042 in Marshall, Texas. April 1st, 2017 - Commander Joe Reynolds and Compatriot Rodney Love attended a Memorial Dedication Service at the Pine Forest Cemetery, Hopkins County, Texas honoring Private Benjamin Franklin Stout. Commander Reynolds served as the Master of Ceremonies. April 3rd, 2017 - 1st Lt. David Richard Reynolds Camp #2270 held our Monthly Meeting at our Headquarters. The Program was titled Chaplains in the Civil War and was given by our own Chaplain Michael Mars. April 4th, 2017 - Commander Joe Reynolds visited the Upshur County Patriots Camp #2109 in Gilmer, Texas. April 8th, 2017 - Commander Joe Reynolds attended and served as Master of Ceremonies for a Memorial Dedication Service at the Hubbard Chapel Cemetery, Bowie County, Texas honoring Private Green Anderson Allison, Company E, 4th Texas Cavalry, the Great Great Grandfather of Compatriot George Linton. April 14th, 2017 - Commander Joe Reynolds manned the Confederate Heritage Display and the Gregg County Historical Museum in Longview, Texas. April 15th, 2017 - Commander Joe Reynolds, Compatriot Rodney Love, and Compatriot Randy Brock attended a Memorial Dedication Service at the Oak Ridge Cemetery, Marietta, Cass County, Texas, honoring James Redding Finley, John Minor Harty, and 18 other Confederate Heroes. Commander Reynolds served as the Master of Ceremonies. Camp Commander Larry "Joe" Reynolds welcomes guests to the Memorial Dedication. April 20th, 2017 - Commander Joe Reynolds and his wife Keithrie attended the monthly meeting at the Red Diamond Camp in Texarkana, Texas. April 28th, 2017 - Commander Joe Reynolds and his wife Keithrie attended the quarterly Military Order of the Stars and Bars meeting in Tyler, Texas. May 1st, 2017 - 1st Lt. David Richard Reynolds Camp #2270, held its monthly meeting at our Headquarters. We had a very good turn out and swore in a new Member. May 5th, 2017 - Commander Larry Joe Reynolds attended "Living History Day" in Jefferson, Texas. Camp Commander Larry "Joe" Reynolds carries the "Battle Flag" in the Civil War Weekend Parade in Jefferson, Texas. The Confederate Hero's Statue on the East Side of the Capitol on the State Grounds. May 13th, 2017 - Commander Joe Reynolds and 1st Lieutenant Commander Rex McGee attended the Graveside Memorial Service for Sgt. William Henry Tuel & Pvt. Hugh J. M. Simpson at the Old Ming Cemetery in Gilmer, Texas. May 20th, 2017 - Commander Joe Reynolds and wife Keesie attended the United Daughters of the Confederacy's Military Awards Ceremony in Gilmer, Texas. June 2nd - 4th, 2017 - Commander Joe Reynolds and 1st Lt. Commander Rex McGee attended the 2017 Texas Division Reunion in Fort Worth, Texas. 5th Brigade, 1st Lieutenant Commander at the 120th Texas Division Reunion. Best Newsletter Award and Best Website Award. June 6th, 2017 - Commander Joe Reynolds and 1st Lt. Commander Rex McGee carried the colors for the Honor Guard at the Veterans Memorial Golf Tournament at Holly Lake Ranch, Texas. June 6th, 2017 - Commander Joe Reynolds attended the Monthly meeting of the Upshur County Patriots Camp #2109 in Gilmer, Texas, where he presented the National Ladies Appreciation Medal to Ms. Esther E. Linton, on behalf of the 1st Lt. David Richard Reynolds Camp. 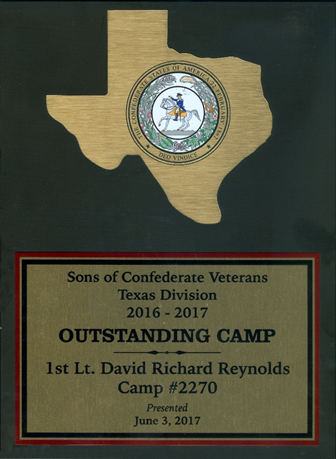 June 15th, 2017 - Commander Joe Reynolds attended the Monthly meeting of the Red Diamond Camp #2193 in Texarkana, Texas, where he presented the Lucy Pickens Award to Ms. Donna Stotts on behalf of the Texas Division, Sons of Confederate Veterans. As Texas Division Awards Chairman, 5th Brigade 1st Lieutenant Commander Joe Reynolds presents Ms. Donna Stotts with the prestigious Lucy Pickens Award and Medal. June 19th, 2017 - Monthly Meeting of the 1st Lt. David Richard Reynolds Camp #2270. We had a full night of Presenting Awards, Celebrating Commander Joe Reynolds' Birthday and heard an informative speech from Steve Austin, Titus County Veterans Service Officer, about Proactive measures to help preserve our monuments. Steve Austin, Titus County Veterans Service Officer and President of the Titus County Historical Society, talks with the Camp about being pro-active with our Monuments. July 1st, 2017 - Camp Commander Joe Reynolds, 1st Lt. Commander Rex McGee and Compatriot Rodney Love joined the 5th Brigade's Confederate Lone Star Color Guard in their march in Ore City's Fourth of July Parade. July 13th, 2017 - Camp Commander Joe Reynolds and wife Keesie attended the Monthly Meeting of the J. M. "Matt" Barton Camp #441 in Sulphur Springs, Texas. July 17th, 2017 - The 1st Lt. David Richard Reynolds Camp #2270 held its regular Monthly Meeting with Guest Speaker Mark Vogl, who gave an interesting and informative program on the Battle of Chancellorsville. We also swore in new Cadet Member, Seth Clark. Two new guests left the meeting with Membership Applications. Guest Speaker, Mark Vogl, talks about the Battle of Chancellorsville. Texas 5th, Northeast Texas, Brigade members at the 122nd Annual Reunion. August 12th, 2017 - Camp Commander Joe Reynolds drove 2nd Lt. Commander George Linton from the 5th Brigade and Camp Commander Phil Davis from the Upshur County Patriots Camp #2109 to San Antonio, Texas to attend the Save our Monuments Rally in Travis Park. You can see all pictures here. August 17th, 2017 - Camp Commander Joe Reynolds and wife Keesie, attended the Monthly Meeting of General John Gregg Camp #958 in Longview, Texas. General John Gregg Camp #958 about Heritage Defense. August 21st, 2017 - We held our Monthly Meeting with lots of visitors, including 5th Brigade Commander Sam Mercer and his wife Christy, 2nd Lt. Commander George Linton, 5th Brigade, Camp Commander Phil Davis and Frank Smith from the Upshur County Patriots and of course our Guest Speaker, Army of Trans-Mississippi Commander Johnnie Holley and his wife Norma. Commander Holley gave an informative and very interesting speech on “The Outlaw Josey Wales” and we swore in two new members. Trans-Mississippi Commander Holley look on. September 5th, 2017 - Camp Commander Joe Reynolds attended the Monthly Meeting of General Sam Bell Maxey Camp #1398, Paris, Texas. September 9th, 2017 - Camp Commander Joe Reynolds and 1st Lt. Commander Rex McGee, attended the Texas Division, Division Executive Committee Meeting in Gatesville, Texas. September 18th, 2017 - The 1st Lt. David Richard Reynolds Camp #2270 held its regular Monthly Meeting with Guest Speaker Garrett Glover, who spoke on John Hall's Military Breechloader Rifles. We also voted on two new members, Shawn L. Tully for full membership and Kaden P. Beggs as a new Cadet member. We also voted on Seth Clark going from Cadet member to full member. September 19th, 2017 - Camp Commander Joe Reynolds and wife Keesie, attended the monthly meeting of the W. W. Heartsill Camp #2042 in Marshall, Texas. CSA Army Service Medal to Compatriot Bill Elliott. September 30th, 2017 - Camp Commander Joe Reynolds and Compatriot Rodney Love attended a Graveside Memorial Service for 7 Civil War Veterans at the Piney Cemetery in Harleton, Texas. Graveside Memorial Service at Piney Cemetery. October 2nd, 2017 - Camp Commander Joe Reynolds attended the 5th Brigade Officers called meeting in Gilmer, Texas. October 3rd, 2017 - Camp Commander Joe Reynolds and wife Keesie attended the stated meeting and Retirement of the Colors at the Upshur County Patriots Camp #2109 in Gilmer, Texas. October 14th, 2017 - Camp Commander Joe Reynolds attended and spoke at the Memorial Service for Pvt. Harvey Sanders, Bodyguard to President Jefferson Davis, CSA, at the New Boston Cemetery, New Boston, Bowie County, Texas. October 16th, 2017 - The 1st Lt. David Richard Reynolds Camp #2270 held its regular Monthly Meeting. Although our Guest Speaker was a no-show, we had a very productive and enjoyable meeting. We swore in a new member, Michael Hayden Simpson, decided to cancel the Annual Birthday Celebration for our Camp Namesake, and discussed the Christmas Baskets, along with the Camp's Christmas Dinner. Michael Hayden Simpson, assisted by 1st Lt. Commander Rex McGee. October 19th, 2017 - Camp Commander Joe Reynolds and wife Keesie attended the monthly meeting of the General John Gregg Camp in Longview, Texas. October 21st, 2017 - Camp Commander Joe Reynolds attended the Second Brigade Heritage Defense Training at Fort Concho, San Angelo, Texas. 2nd Division Heritage Defense Training in San Angelo, Texas. October 21st, 2017 - Compatriot Rodney Love attended the 2017 Yamboree Parade, in Gilmer, Upshur County, Texas. Compatriot Rodney Love, getting ready for the Yamboree Parade in Gilmer, Texas. October 26th, 2017 - Camp Commander Joe Reynolds and wife attended the Colonel Richard Bennett Hubbard Chapter 261, Military Order of the Stars and Bars, in Tyler, Texas. October 28th, 2017 - Camp Commander Joe Reynolds, 1st Lt. Commander Rex McGee, Chaplain Michael Mars, and 5th Brigade 2nd Lt. Commander George Linton, manned a Recruiting Booth at the Fall Festival at Omaha, Texas. at the Recruiting Booth in Omaha, Texas. November 7th, 2017 - Camp Commander Joe Reynolds attended the Upshur County Patriots Camp in Gilmer, Texas. November 16th, 2017 - 1st Lt. David Richard Reynolds Camp #2270 Executive Council met to develop a slate of officers for the 2018-2019 year. November 18th, 2017 - Camp Commander Joe Reynolds and 1st Lt. 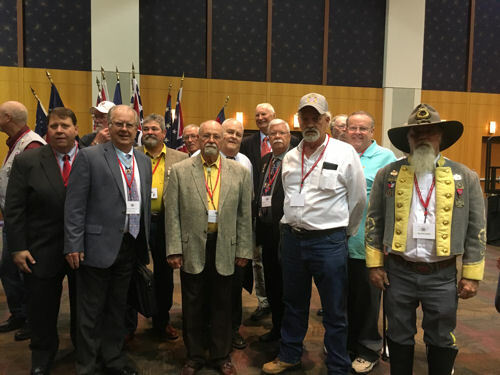 Commander Rex McGee attended the Northeast, 5th, Texas Brigade meeting in Pittsburg, Texas. November 20th, 2017 - The 1st Lt. David Richard Reynolds Camp #2270 held its regular Monthly Meeting. We discussed the Christmas Party and the Christmas Baskets that we will be giving out this year. Annual election of officers for the 2018-2019 year was held and all officers were elected. November 30th, 2017 - Camp Commander Joe Reynolds Participated with the Lone Star Color Guard in the Gilmer Christmas Parade in Gilmer, Texas. Upshur County Patriots getting ready for the Parade. December 2nd, 2017 - Camp Commander Joe Reynolds Participated with the Lone Star Color Guard in the Ore City Christmas Parade in Ore City, Texas. during the Ore City Christmas Parade. December 5th, 2017 - Camp Commander Joe Reynolds attended the Upshur County Patriots Camp 2109, Christmas Party at Gilmer, Texas. at the Upshur County Patriots Christmas Party. December 14th, 2017 - Camp Commander Joe Reynolds attended the Red Diamond Camp 2193, Christmas Party at Texarkana, Texas. Camp Commander Joe Reynolds at the Red Diamond Christmas Party. December 18th, 2017 - The 1st Lt. David Richard Reynolds Camp #2270, held its 2nd Annual Christmas Party. We had over 50 in attendance, including special guests, Paul and Linda Gramling – Sons of Confederate Veterans Lieutenant Commander; Johnnie and Norma Holley – Army of Trans Mississippi Commander; Dennis and Rita Brand – 2nd Lieutenant Commander, Texas Division; George and Esther Linton – 2nd Lieutenant Commander, Texas Northeast, Texas, 5th Brigade; Eddie Pricer – Aide-de-Camp, Northeast Texas, 5th Brigade; Phil Davis – Commander, Upshur County Patriots Camp #2109; Jerry and Marilyn Bolding – Adjutant, Matt Barton Camp #441; James and Ann Holley – Red Diamond Camp #2193; James Murphy – Red Diamond Camp #2193; Robert Murphy – Red Diamond Camp #2193; John Phillips – Red Diamond Camp #2193; Jeremy Shaver – Red Diamond Camp #2193 and potential new member, Austin Young and Mother Katy Young. 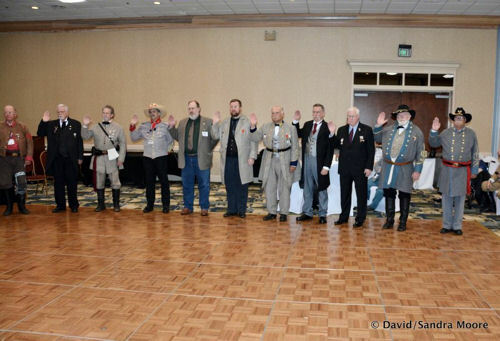 The highlight of the evening was our Ancestor "Roll Call" and then swearing in four new members. Kaden Beggs (Cadet), Charles Merka, and Shawn Tully. and Cooper Goodson - Adjutant/Treasurer. December 21st-22nd, 2017 - Camp Commander Joe Reynolds and Chaplain Michael Mars delivered Christmas Baskets and Turkeys to Four needy families, one in each of our counties. Camp, Franklin, Morris and Titus County.